The Olivia Fiddes x Faye Toogood collaboration comprises of a set of 7 pieces, in cream and charcoal. The collection plays with scale, texture, and light and dark. They are designed in Olivia’s ‘hand built’ style, which uses traditional techniques such as coiling. Each piece is one of a kind, featuring the noticeable marks of the maker. Rather than a traditional foot-ring, bowls and cups have been adorned with a thick coil of clay on their base. 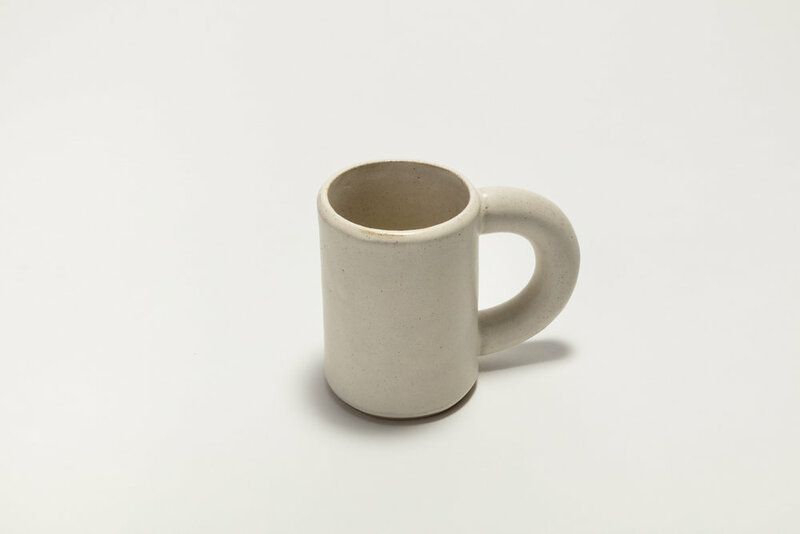 This compliments the mug’s ‘chubby’ handle and the overall oversized aesthetic of the collection. The pieces have been made by hand in Hoxton, London. They are created in a sanded-buff stoneware clay and a coarse black stoneware. Each piece is made, left to dry then fired to 998 degrees centigrade – bisque stage. Following this they are glazed and then fired one final time to 1235 degrees centigrade. The charcoal pieces have transparent glazed interiors – leaving the black clay exposed on their exterior. The sanded-buff stoneware is glazed entirely in crème de cèraline. These features create a beautiful comparison of light and dark, rough and smooth, and rawness and elegance. Pieces are available from House of Toogood, 71 Redchurch Street, London.